The New WEIN VI-3500 produces a tornado of negative ions that reduces pollutants and contaminants! Negatively charged ions are beneficial to the environment because they attract the positive ions found in dust, pollen, bacteria, cigarette smoke, mold spores -even toxic chemical fumes- and pull these microscopic hazards to the earth using electrostatic forces. With the contaminants no longer airborne, the air becomes cleaner and fresh smelling. In nature, rainfall is the most effective of all air cleaners -a typical shower produces trillions upon trillions of negative ions. Indoor living spaces do not benefit from this natural ionization process -tight insulation and poor air circulation even compound the problem. Positive ions become trapped indoors where no negative ions can be produced… not even by air conditioners which simply cool already polluted air, destroying the few negative ions in the air when it passes through the ducts. The Vortex VI-3500 Room Ionic Air Purifier uses the wonders of miniature technology to imitate nature’s ionization process in one of the most compact, efficient and economical air purifiers available. Small enough to use in any room, yet powerful enough to clean large air spaces, the Vortex VI-3500 Room Ionic Air Purifier is more effective than many larger, more costly units. Beginning the moment you plug it in, the Vortex VI-3500 Room Ionic Air Purifier releases a powerful steam of 3.4 trillion ions per second into the air in a pulsing “on-off” cycle. During the “on” cycle, powerful vortex waves of ions are electronically swirled into the air at a rate of 150 feet per minute, effectively washing the air of even the most microscopic pollutants. Meanwhile, a built-in ion detector monitors ion production levels. During the “off” cycle, the ionized pollutants fall harmlessly to the foam collector pad on the Vortex VI-3500 Room Ionic Air Purifier or to the floor. The pollutants are removed during your normal vacuuming and dusting, and when you wipe the Vortex VI-3500 Room Ionic Air Purifier pad clean. And, unlike other ionization units, the Vortex VI-3500 Room Ionic Air Purifier ion emitter stimulates airflow by discharging ions in a rapid, spiral vortex motion -actually drawing airborne pollutants to the device, instead of waiting for them to randomly pass near the unit. 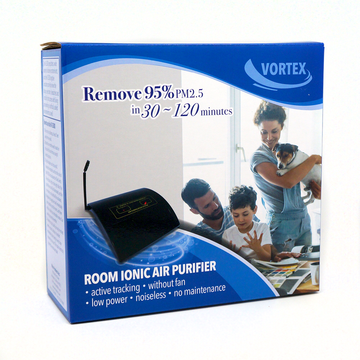 And the Vortex VI-3500 Room Ionic Air Purifier negative ionization can help relieve the fatigue, eye strain, headaches and irritability that comes with living and working in artificial, sealed environments as well. Place unit on a tabletop, at least 2 feet away from any walls. Rotate the ion emitter wand located on the back of the unit into an upright (vertical) position. Plug the adapter unit into any AC household receptacle, and into the back of the VI-3500 and activate the push switch. The red status light on the right side of the top of the unit will be illuminated, and the ion monitor on the left will be activated. Negatively charged ions will immediately start spreading into the room, and there will be a subtle but noticeable vortex of air swirling around the emitter. A harmless static build-up may be noticed when a grounded surface is touched immediately after being in very close proximity to the unit. This static electricity is perfectly normal and safe. Dust, mold smoke, germs, pollen, allergens odors.